Brook Hurst Stephens, the blogger behind Learn to Preserve and preserving extraordinaire, says of her recipe, "Even though this is called Pear Honey, there's no honey in this recipe. I'm not sure where it originated, but judging from the number of older people who remember their grandparents making it, I think this recipe goes back a few generations. I believe it's called 'honey' because of it's silky-smooth texture and nectar-like taste, but your guess is as good as mine. I prefer Bartletts for this, but you could try other pears if you so desire. If you don't want to make such a large batch, cut the recipe in half, using a small pineapple, or half of a large one." Peel, core, and cut pears into chunks and add them to the pineapple and lemon juice. You should have approximately 12 cups of fruit. Add sugar to the fruit mixture, stir well to combine and cover. Let it sit on the counter at least one hour, but preferably 8 hours, or even overnight. The longer it sits, the more juices will be pulled from the fruit, forming a wonderful syrup in the bowl. After letting the mixture sit the desired time, stir mixture together well, scraping any sugar that might have collected on the bottom of the bowl. Place mixture in a heavy-bottomed non-reactive pan. Bring to a boil over medium high heat and cook for about 20 minutes, stirring occasionally to prevent the fruit from sticking to the bottom of the pan. Stir the fruit gently while cooking to reduce foaming. After about 20 minutes, the fruit should be softening, and you can use an immersion blender or potato masher to periodically mash the chunks and create a smooth texture. Boil for 5-15 more minutes, stirring, until the jam either thickens to your liking or until it reaches 220 degrees on a candy thermometer. You can also use the sheeting test. 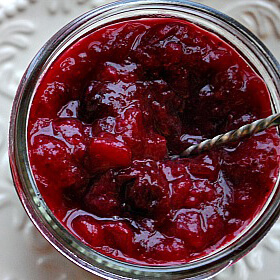 Ladle jam into clean hot jars to within ¼” of the top, wipe rims spotlessly clean and place a lid on top of jar. Next, screw a band onto the jar until finger-tight. Process for 10 minutes* in a boiling water bath. Turn kettle off and let jars rest in kettle for 5 more minutes. Remove jars from kettle using jar-lifter tongs, and gently set aside to cool on the counter, on a kitchen towel, in a draft-free place. Let rest for 24 hours, then check jars for a proper seal before storing. If jar lid seals, it will keep for one year in a cool, dark place. If jar doesn’t seal, place in your refrigerator and eat within 3 months, and within one month after opening. Important: Check lids for a proper seal by pressing down on the middle of the lid with a finger or thumb. If the lid stays down, it is sealed and will easily keep for up to one year in a cool dark place. If the lid springs up when you release your finger, the lid is not properly sealed. It got the name ‘honey’ due to the color that it turns as it gets done. The golden brown color. 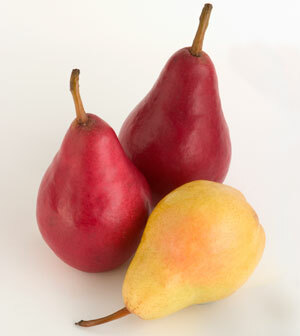 Interested in Pears, from when they ripen to canning & Peserves.